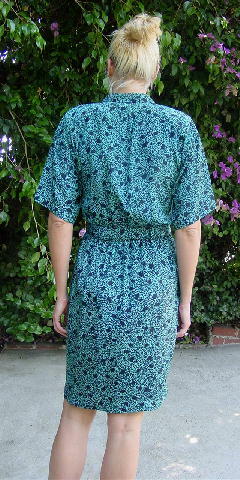 This half-length sleeve dress is 100% polyester and was made in the USA by Elizabeth. 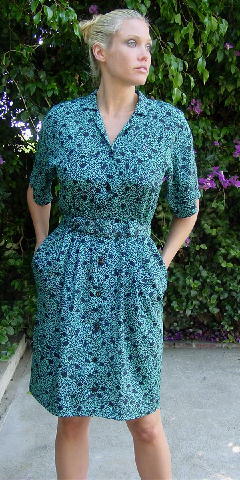 It has fabric matching shoulder pads, large belt loops, and a fabric matching pull-through buckle belt. There are 8 black buttons down the front and one on the breast pocket. 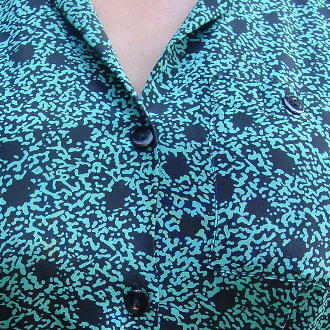 It has a black freeform design pattern and a background in light teal green. There is a snag in the fabric near the tip of the belt. There is elastic on the back of the waistband. shoulder to shoulder 19 3/4"
shoulder pad to shoulder pad 15 1/4"
shoulder to hem 39 1/4"